If there’s one product every blonde needs, it’s purple shampoo! To keep your light locks from looking a little yellow or dull, keep reading to discover everything you need to know to get the best from your blonde and wave goodbye to brassiness! You may be asking how does purple shampoo work? To explain exactly how it works, we’re going to get a little technical! In the colour theory, purple is opposite on the wheel to yellow. Essentially, the purple acts as a toner. It’s best to use after a purifying and clarifying shampoo as this will remove product build-up to allow your hair to fully absorb the purple shampoo. Completely dependant on your hair, we recommend observing your locks before use. Whilst it can be used as a regular shampoo every time you wash your hair, this may result in a bit of product build-up. 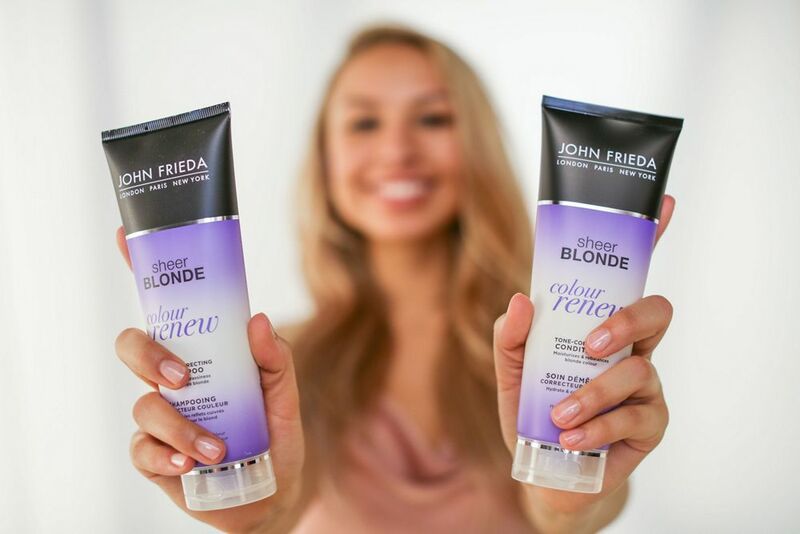 The John Frieda purple shampoo is suitable for every day use to keep your blonde away from brassiness. If you have thick or damaged hair, the tone from the purple shampoo may absorb quicker, so you might want to leave it on for not as long as you would on fine or not damaged hair. Is it only for blondes? Whilst it is essential for any bleached blonde, if your caramel ombre is looking too warm or your chestnut looking a little too red, you can use purple shampoo in the same way as a blonde and reduce any brassiness. How long do I leave purple shampoo in my hair for? Again, this totally depends on your hair as well as what product you are using. We would recommend to stay with the instructions on the package. Different formulas vary and can range from rinsing immediately to leaving on for 5 minutes or longer. A purple shampoo will not dye your hair but if you leave it on for too long you could find yourself with a little lilac staining. It’s easy enough to get rid of - just wash your hair with a clarifying shampoo to reduce the tint! Ready to say goodbye to brassiness and make your blonde the best it can be? Discover Sheer Blonde Colour Renew Tone Correcting Shampoo & Conditioner.